How I Organized My Linen Closet In 2 Hours! Do you have trouble organizing your linen closet? Is it too big or too small? Do you have wasted space that is not being utilized? 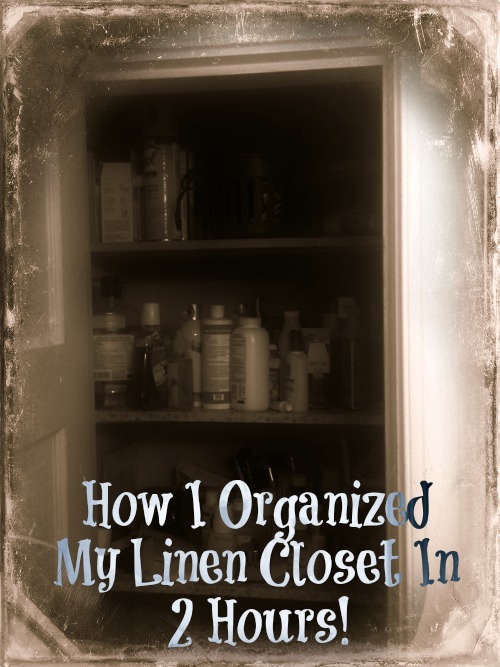 Would you like to know how I organized my small linen closet and how you can organize your linen closet too? If you answered yes to any of these questions then keep reading. I will show you step by step how I organized my linen closet and utilized my vertical space in about 2 hours. I live in an old home. It’s over 80 years old. As you can imagine the closets are very small throughout the whole house. The one good thing about my linen closets in the bathrooms though are they are deep and tall. So that leaves me with a few challenges that my clients often run into. 1) What can I do with all this wasted space? and 2) How can I maximize the height? Your in luck! Today I will share with you my step by step of how I solved both problems in my own linen closet and how you can do the same thing. So let’s get into it. My closets consist of 4 shelves. I wanted to be able to utilize how I was using each shelf for all of my needs. I also wanted to utilize the floor of the closet because it is pretty good vertical space to the first shelf. So the first thing I did was take everything out of the closet. This is a vital step because you want to have a clean slate to put things back into. And you want to see what space you have to work with. After I took everything out I started to throw away things that I didn’t need anymore and things that needed to go away. After that I started to group everything in categories. So for example anything that had to do with first aid or medicine was one group. Lotions and body powders was another group. I had a group for makeup and a group for dental supplies. I also had a group for medicines. Once everything was in a group I then went and got my storage containers that I was going to use to keep the groups together. Luckily I had some that I had been holding on to and I was able to empty out others. You may have to go and purchase some at this point if you don’t already have something to put things into. Then I put everything in the containers and started putting the containers back one by one on the shelves. But I first had to decide what I wanted on each shelf. 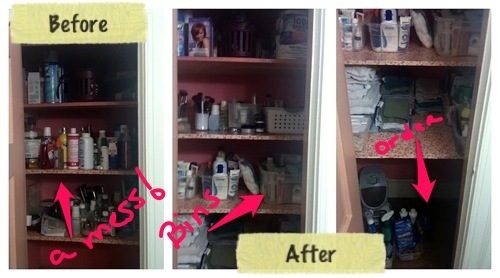 I decided to put towels and hair products on the bottom shelf. I next put medicines, first aid and dental stuff on the second shelf. The third shelf I put makeup. On the fourth shelf I put excess supplies like toilet paper and air fresheners and sheets. On the floor of the closet is where I put cleaning supplies for the bathroom and a space heater. All of this took me less than two hours to complete. When I was done I let everyone see in the household how it looked and know where to put things back. I didn’t label the bins because they are clear and pretty self explanatory. By putting excess supplies on the very top shelf I am able to utilize all of that vertical space that would normally go wasted. If in the future I need more space I can just have a handyman add another shelf up top because the ceiling is tall enough in the closet. So that is how I organized my linen closet in 2 hours. You can do it too. All you need to do is follow the simple steps of: clearing out, purging, grouping, containerizing, and putting things in place. If you want to shave off even more time you might want to already have a plan for what you want on each shelf before you get started. Also have your containers already there or purchased and a trash bag.